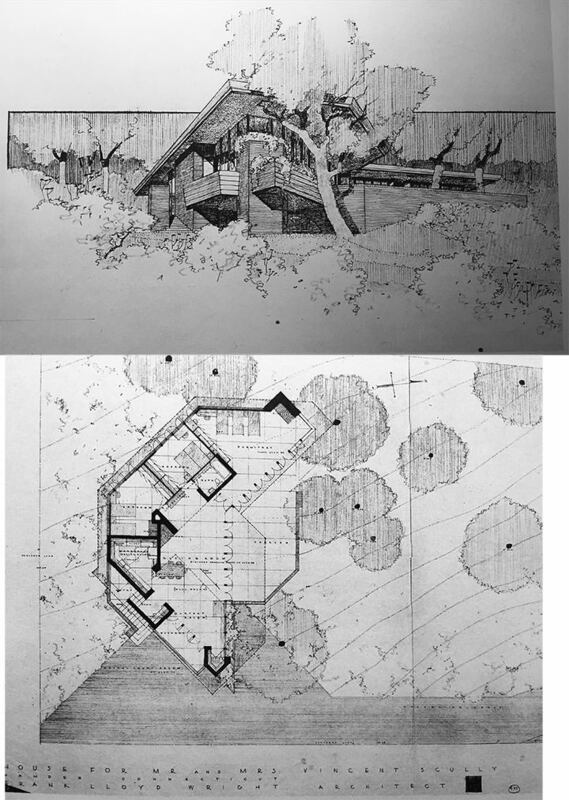 "...he recalled a conversation he once had with Frank Lloyd Wright, the renowned architect who developed his linear Prairie Style of architecture in the first decade of the 20th century: "He said, 'Son, architecture began when I began building houses out there on the prairie.' What a confidence man, what a crook!"" The next sentences read: "Scully admired some of the buildings by Wright and other towering giants of modern architecture, including Walter Gropius, Le Corbusier and Mies van der Rohe, but he began to see an emptiness at the core of their designs. What they lacked, Scully concluded, was the human touch. 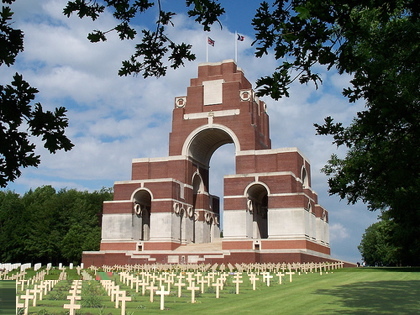 "He began to teach that architecture was about more than pure design. Its purpose was not to burnish the ego of the architect but to provide humane and beautiful places for community life to flourish. 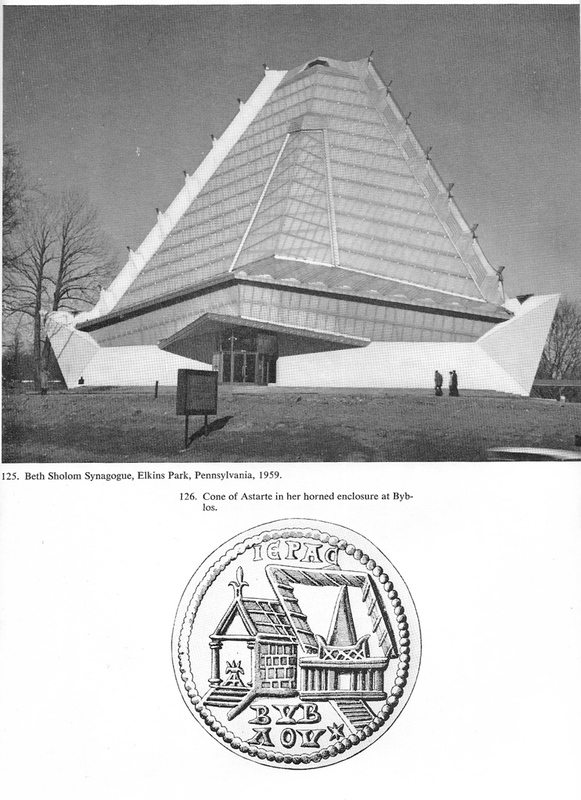 "Practically alone among architectural scholars of the time, Scully began to emphasize the importance of the past. In his lectures, he stalked the stage, using a long wooden pointer to direct attention to images of Greek temples, the Sistine Chapel, French formal gardens, American Indian dwellings, New England town squares and Italian villages." I did not hear Scully speak. I know him from two books, the Wright primer that many of us must have seen or owned in our early years, published in 1960 by G Braziller in the short series "Masters of World Architecture" (Nervi by Huxtable, Mies by Drexler, etc), and, much more recently, "Architecture, the Natural and the Manmade" (St Martin's, 1991) which, being a sort of world history of the art in its relation to site, affords Wright a mere seven pages and nine images, with which he treats Taliesin West as an object laid out within an array of sightlines, the most important of which are mountains in the landscape (or "horns," a term Scully uses repeatedly throughout). Scully clearly has warmed to Wright over the decades. 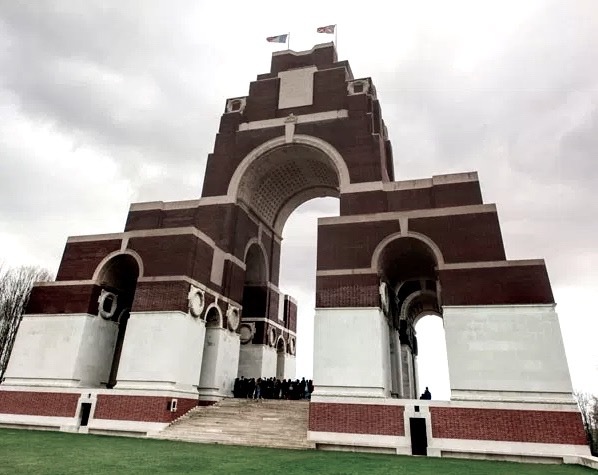 I suggest that we wait for further response, from critics and professionals presumably more experienced in architecture than the obit writer for the Post, which critique will appear in due course in the architectural press ? I met Scully about a decade ago. I talked to him for a long time at a party at Yale. He is very entertaining even in small talk. I also sat in on one of his history lectures which was in the auditorium adjacent to Kahn's Yale Art Gallery. He was mesmerizing talking about classical Roman architecture. I recall he explained to his students that the Romans were basically a bunch of skinheads. American skyscrapers of the 1920s. It is also an enormous monster; its tondi are eyes; its high arch screams. It is the open mouth of death . . .
emptiness, meaninglessness, insatiable war and death. There is no victory for the dead. All that courage wasted. It is not to be borne." 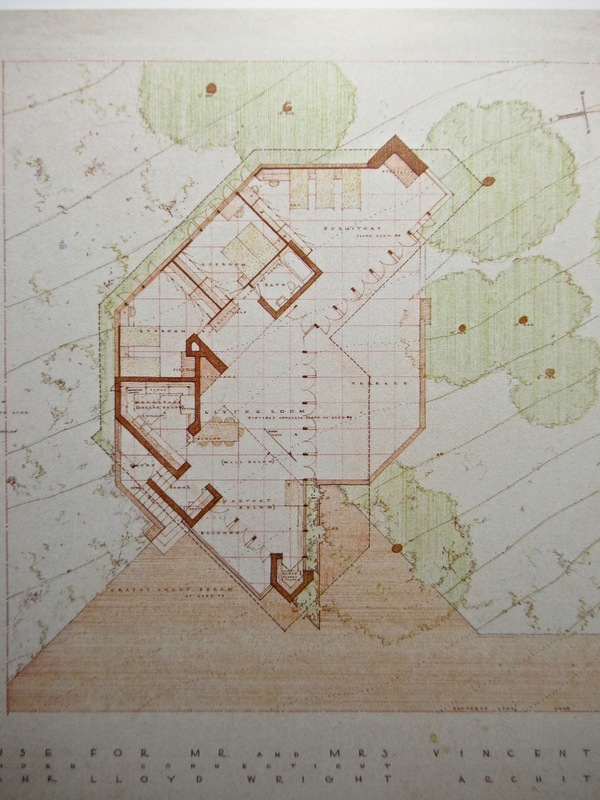 Scully must've highly admired Wright's talent since he hired him to design his own house in 1948. Unfortuntately, he couldn't afford it once the construction bids came in so it was never built. Hope James won't be offended if I up the ante, with color images of (presumably) the same drawings, from Taschen. Now we can read the floor plan. He was born in 1920, so he was only 28 years old in 1948. The "Dormitory" would've been for 3 young children (from his first of three marriages). After the war he'd returned to Yale in 1946 and finished his PhD thesis in 1949 (later published as his book on the Shingle Style). So, I imagine he could've really used a private study or library in this house, but we only see a small desk in the corner of his bedroom. I would imagine he'd have plenty of books, which were presumably accommodated on shelves near the south triangular corner, where at the tip of the triangle we see a built-in nook for the "radio & record player". With the family of five, that single bathroom would've seen plenty of use. With three fireplaces it would've been cozy in the winter. He was a bold young man to hire Frank Lloyd Wright at that age & stage. I wish it had worked out. 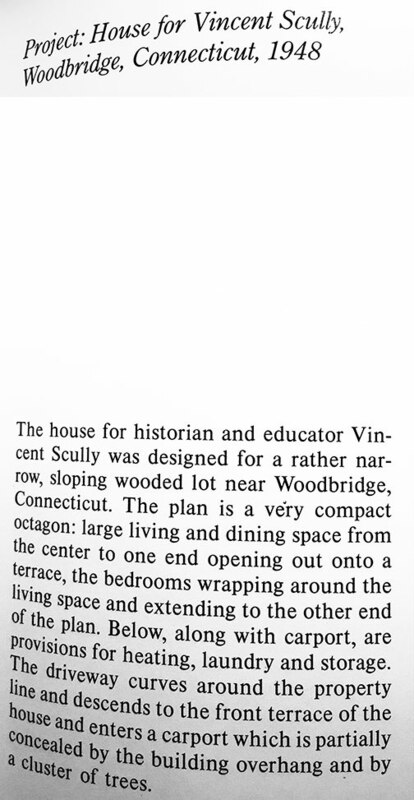 But Scully had a different and much simpler, flat-roofed house built in the Connecticut woods. I'm trying to find it; I thought maybe we had discussed it here a couple of years ago. 'The Earth, the Temple, and the Gods' is another good book of his. Scully spoke at a FLWBC conference in Chicago at the Auditorium Building. The subject was primarily how FLW used his apprentices as free labor, drawing parallels with slavery ... which I thought a bit over the top. That is a bit much . . . It's been awhile since I saw the thing, but I remember that Scully was one of the talking heads on Ken Burns's FLW documentary. I don't remember if his comments were, on balance, positive or negative. I have. But it seems that Mr Scully has been, as you say, an admirer, and from an early date, to judge by his premature commission of a house design. has found things to question in Wright's career, but their occasional burps should not be mistaken for disrespect, it seems to me. a force to be contended with -- at least ? I went and looked at the first half of the Ken Burns thing, and Scully appeared twice. He spoke beautifully & poetically at the 27:25 mark. And, then again at the 41:00 mark. At 41:45 in the YouTube is an image of the ends of the pews of Unity Temple, a detail mentioned in an earlier thread. The curve in the drawings of this almost relentlessly (but for the light globes) rectilinear space look somewhat jarring, but they work to soften the hardness all around.